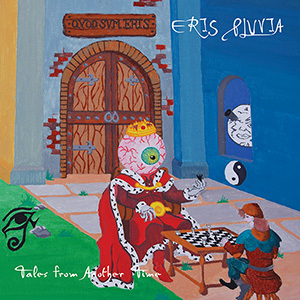 Eris Pluvia’s story is peculiar, but also common to many other bands: they released an album in 1991, “Rings of Earthly Light”, which contributed to the rebirth of the Italian prog scene, and then disappeared for many years until 2010, when they came back with “Third Eye Light” (AMS188CD). Despite the premature passing of the group’s founding member and keyboard player Paolo Raciti, the group has nevertheless maintained synergy and inspiration in the making of the following “Different Earths” (2016, AMS276CD) and of this new and, in some ways surprising, “Tales from another time”. On this occasion, if possible, Eris Pluvia have further raised their compositional level, without denying in any way their trademark: Camel and Pink Floyd remain the main references but, more than the ’70s, Eris Pluvia seem here to take inspiration, thanks to a proper dosage of electronic music and to the guitar and drums sounds in particular, from the following decade. This, however, does not mean that the band has indulged to some easy ‘commercial’ solutions: the six long tracks of the album – for a total of one hour of music – remain totally faithful, in their structure and purpose, to the classic ‘progressive’ creed, offering long instrumental sections and folk/pastoral interludes with the flute in evidence. More and more modern, yet still faithful to the past: sounds like a paradox, but Eris Pluvia manage to be both with apparent natural simplicity. A band in constant evolution, that have just released another significant piece of work in the current Italian prog panorama!